Less than four years after RIOC doled out cash for them, causeway bridges on Lighthouse Park are wasted. 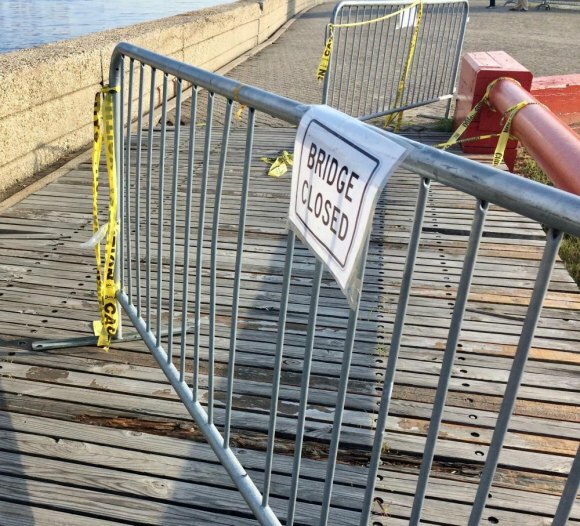 "The Lighthouse Park footbridges washed away by Hurricane Sandy in October 2012 have been replaced," the Roosevelt Islander reported in July, 2014. Until Sandy's flood surge wrecked them, the bridges welcomed visitors for decades. It took RIOC nearly two years to replace them and nature just four more to expose the lousy workmanship. But that's not even close to the worst of what we found yesterday. For a year and half after Sandy, tall, metal fencing blocked access to the tip of Lighthouse Park. 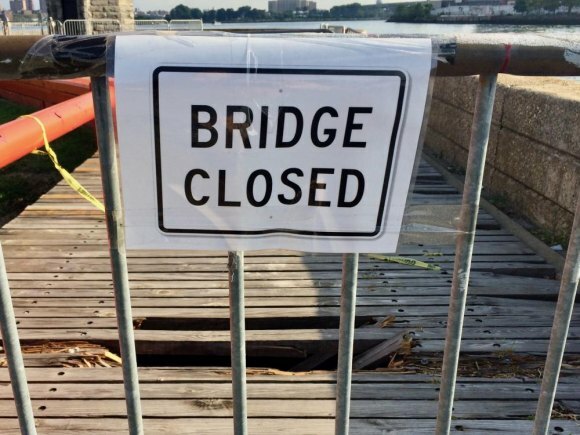 Residents complained about the glacial pace of repairs, but finally, in April of 2014, City and County Paving, RIOC's contractor, began work on replacing the wooden bridges crossing a small causeway. The work was completed by July. The bridges consist of slats laid against concrete supports, maybe all of six feet long. A conscientious homeowner might round up friends and complete the work in a couple of weeks and make it last. City and County Paving, a Bronx concern with no apparent qualifications or experience relative to this work, took two months. The homeowner might've checked with his supplier, maybe at Loews, and made sure he bought properly treated wood. City and County Paving did not. RIOC paid them for work that held up for less than a measly four years. 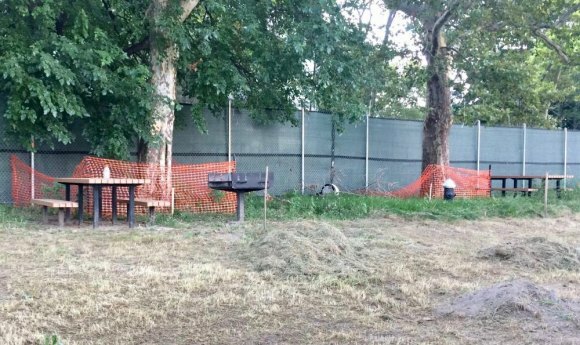 The mess RIOC's made of our parks is substantial and often unmitigated. "Several trees adjacent to the Octagon, some picnic tables and barbecue grills, along with the iconic Sabrina statue were to be replaced and or relocated nearby to clear space," DEP promised. Never happened. Where was RIOC? To get to Lighthouse Park, where we found conditions that shocked us, worse than anything we expected, visitors pass an eighth of a mile of tall, green emergency fencing with which the City Department of Environmental Preservation was allowed to scar the Island all summer, mangling a popular picnic location and blocking river access. DEP blamed "contract problems." Whatever that means, it was good enough for RIOC, which ignored the situation until contacted by The Daily in late July. "Several trees adjacent to the Octagon, some picnic tables and barbecue grills, along with the iconic Sabrina statue were to be replaced and or relocated nearby to clear space," RIOC echoed DEP's claims. But as you can see, as the last summer holiday weekend passes, DEP failed while RIOC napped. Tables and grills were never moved. Instead, they were fenced in, inaccessible to families hoping to celebrate the holiday outdoors. I snapped a photo, which I'm not using here because the deteriorating conditions of potholes along the promenade seemed trivial by the time I'd walked the rest of the way through Lighthouse Park. Visitors simply shove RIOC's useless fences aside, leaving yellow tape flapping in the breeze. There, lame attempts to block off broken bridges are ignored. Metal fences pushed aside and yards of ineffective yellow tape tell a story prefaced by a PSD officer relaxing on a bench under a shady tree nearby, reading something on his cellphone. I'd have greeted him if he looked up. He didn't. I could've been carrying a hatchet. No prob. 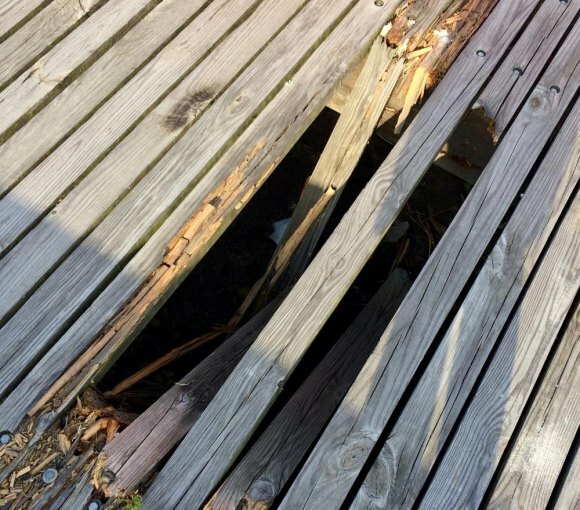 I'll let pictures tell the story of bridges built so badly that the wood's rotted through, leaving gaps anyone can fall into and, likely, someone already has. They sag so badly as you step on still intact slats, you're wise to step to the edges and walk on the concrete. 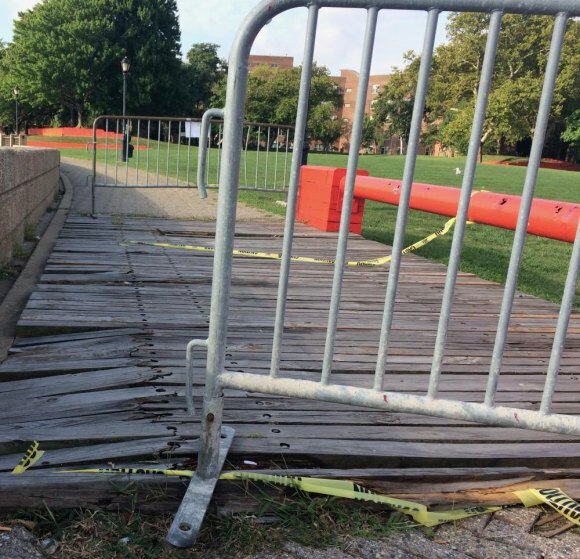 Improperly treated wood by an apparently unqualified contractor leaves it destroyed after a few years. Third World conditions, up close and unmitigated, remaining this way all summer. Where was RIOC? Poor workmanship by RIOC contractors is not news. Leaving hazards in place for months, as is the case here, is impossible to ignore or excuse. The State unabashedly maneuvers Roosevelt Island into a virtual Third World of failed infrastructure, esthetic disgrace and disregard for people's welfare. 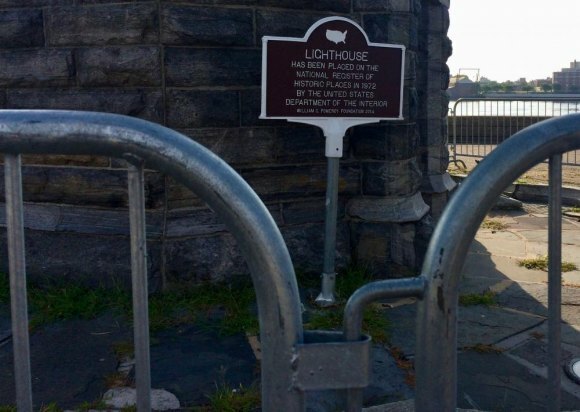 Another depressing symbol is our historic lighthouse, blocked off for no apparent reason by ugly metal fencing. No signs to explain anything. If it's supposed to limit access, it fails. Any kid with a spray can tucked in his pocket can get over it in a nanosecond. All the fencing really does is render a lovely remnant of the past ugly. An elegant, preserved icon insulted by RIOC. All of that faded in concern when I checked out the drinking fountains RIOC says it shut off in June after it was discovered that they were supplied by an irrigation system, water potentially contaminated by feces, insecticides and an array of viruses and bacteria unfit for human or animal consumption. The federal Environmental Protection Agency says such water should not be used even for washing your hands. But, as our video from September 2nd, 2018, shows, RIOC offers it without restriction or warning to the public. No contaminated water signs, as required by law, two months after the hazard was reported, are anywhere in sight. RIOC, at least under its current administration, isn't simply negligent but is incapable of preventing the most obvious risks to life and safety. As a patronage dump for Governor Andrew Cuomo's Albany mill, the agency's been reduced to a shell of one that once made a proud commitment to Roosevelt Island. Whether the State ever lived up to that commitment is debatable, but this current rendition, fattened by contracts and excess payroll, often seems unable to even fake it.